Newest Gouache- "Rose Red of the Dead"
Do you ever notice that, despite many many MANY re-imaginings of fairy tales, you will often see Snow White included, but rarely Rose Red? One of the few modern day remixes of classic fairy tales I can think of where she is a major character would be Fables (thank you, graphic novel world!) In fact, the stories of Snow-White and Rose-Red and the story of Snow White and the Seven Dwarfs are two completely different tales (despite each having a 'Snow White'), even though they both made Grimms' and other story editions, and their names are only distinguished by the hyphen in the spellings. But anyway... I used to have a copy of Snow White and Rose Red in children's book form and I enjoyed it a little more than Snow White (although I have made art about her too! ), as the story of the sisters involved them actually doing the rescuing of others. I titled this little gouache after Rose Red, simply because there need to be more Rose Reds in the world. It is embellished with gold acrylic and the black is flat on the paper absorbing the light in a velvety smoothness... one of my favorite things about gouache is the opacity. 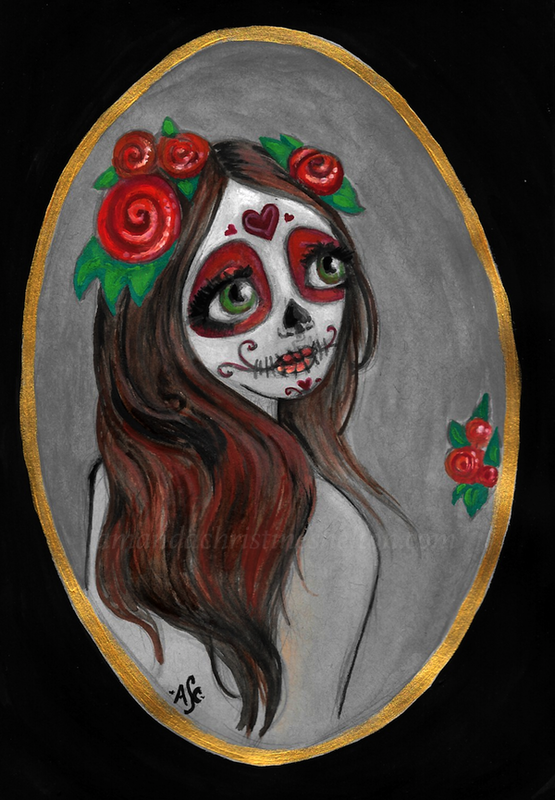 Are you a fan of all things Day of the Dead ?? use the contact page on my website to get started! *still subject to my regular commission terms.